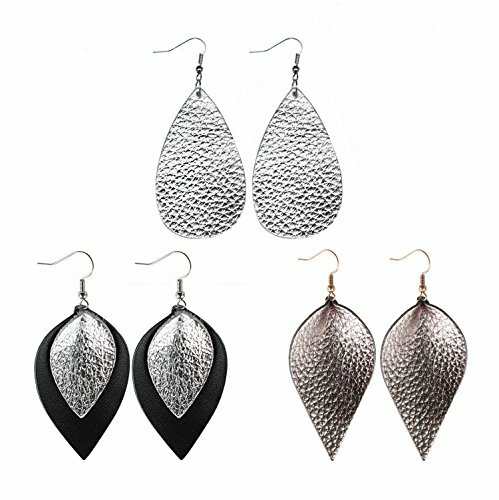 These fashion leather earrings features high-quality GENUINE LEATHER HIDES with great gloss and finished with NICKEL FREE antique copper, silver or gold ear wires which make it much better looking compare with other faux leather earrings. Statement bohemian style, super lightweight and right on trend. They are sure to be a fun addition to your wardrobe, unique and goes with everything. This design was inspired by a pair of Joanna Gaines' earrings. We added more trendy elements, textures and colors for you to choose. Place a drop of your favorite oil(s) on the back of the earring. The leather is a natural diffuser and will naturally diffuse the essential oils throughout the day. These leather earrings are so popular now. All earrings are hand cut and made of Genuine Leather which is a wonderful material for statement earrings. It makes for a lightweight, flexible and comfortable accessory that you will forget you are wearing! Leather earring drop down to about 3.15" (8.0cm), cute and elegant. It weights only about 0.1oz for 1 pair earrings. Made of Genuine Leather which is a natural diffuser will diffuse the essential oils throughout the day, and finished with Nickel Free antique copper, silver or gold ear wires. If you have any questions about this product by Me&Hz, contact us by completing and submitting the form below. If you are looking for a specif part number, please include it with your message.